Classic parallel pliers are an essential bench item, and are often part of even the most basic tool kit for jewellers. Quite different in appearance from other pliers, parallel action pliers hold their position thanks to a compound box joint system, which means they provide an extremely strong grip and won’t spring back once pressure is released. 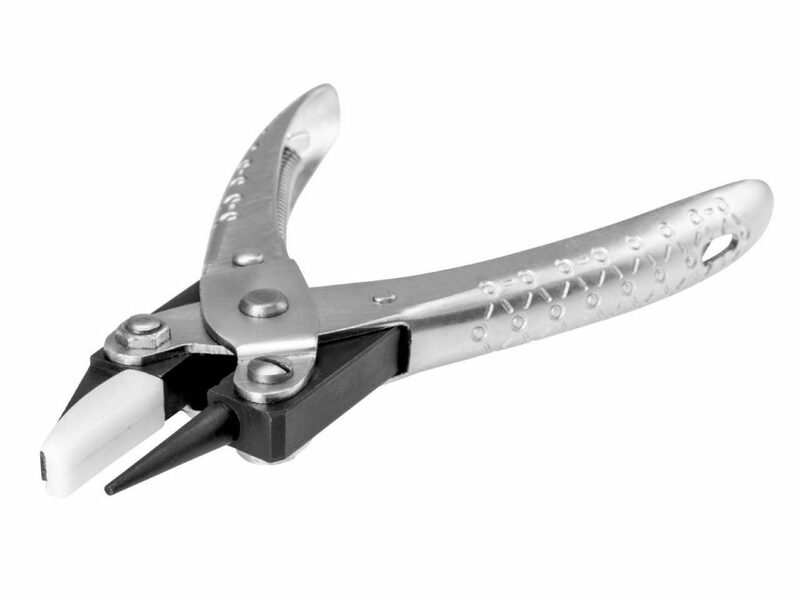 As the name suggests, the jaws of parallel pliers remain as such along their entire length so you need not worry about positioning metal within them as the results are uniform throughout. Particularly useful for wirework, these pliers are ideal for straightening and flattening out kinks in wire, jump rings, earring fittings and much more besides, but are also useful for creating nice clean bends thanks to their uniform shape and sharp right angles. You might be surprised to discover that there are in fact many designs available within the classic parallel pliers family, with no less than 14 different versions now available at Cooksongold – including two versions with nylon jaws which help to protect metal from marks whilst you are working. Nylon jaws are also particularly useful when working with sheet as well as wire, to give you that little bit of extra confidence against damage. You can choose from the classic flat nose design or the innovative round/nylon flat nose version pictured below, which has a combination of both nylon and steel jaws to gently hold work whilst shaping. 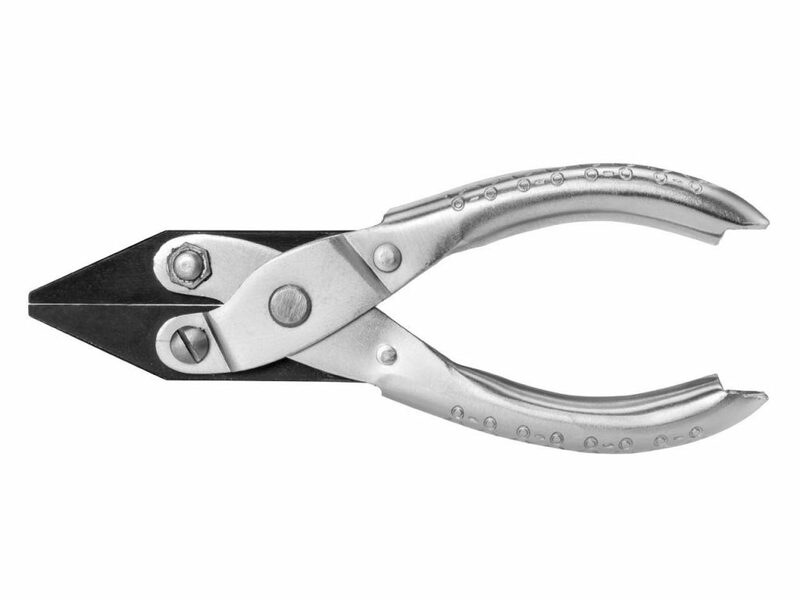 Both of these pliers are supplied with replacement nylon jaws, which can also be purchased separately when they eventually wear out. However, if you require a slightly firmer grip but still want to protect your work against nicks and marks, these classic parallel pliers are also available with a brass jaw. 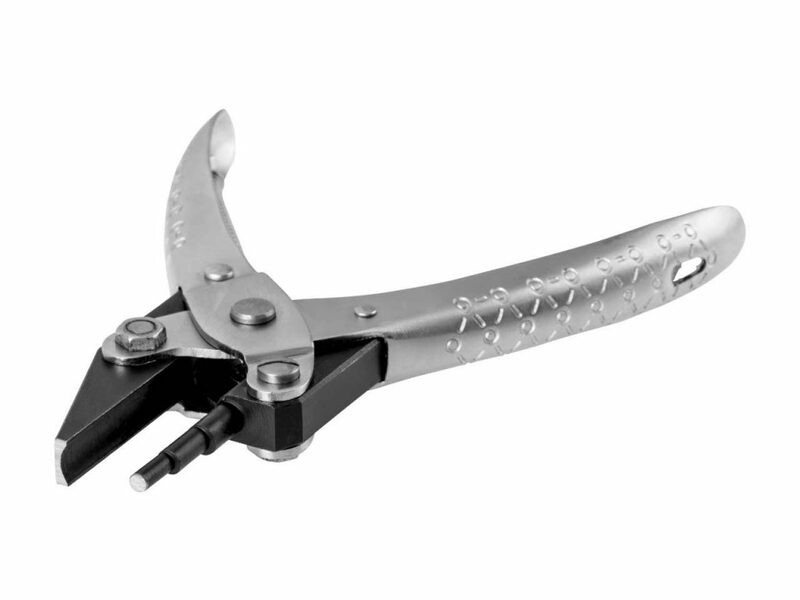 It is the same classic flat nose plier design, but the softer brass plates are positioned towards the tips of the jaws to provide a little extra protection for both bending and flattening. 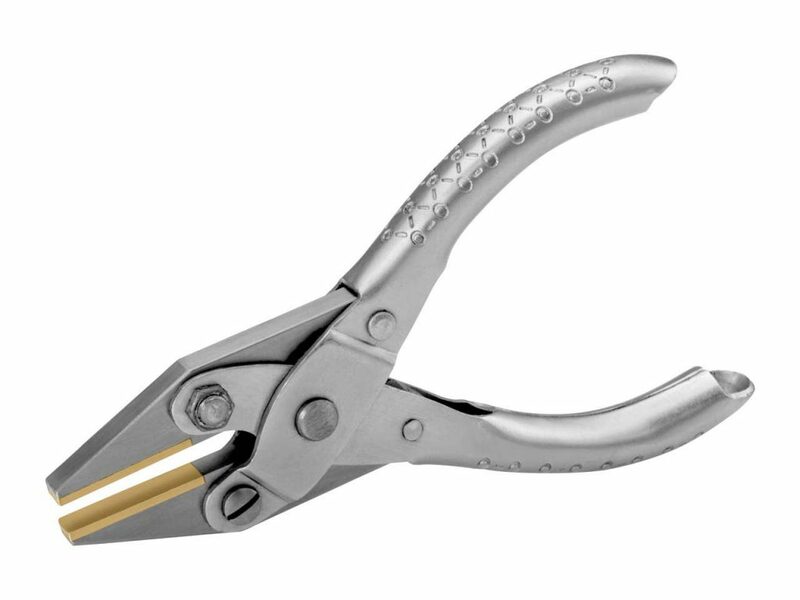 Brass offers a grip somewhere between the nylon and the steel options, so these pliers are ideal if you are looking for something in the middle ground. If bending metal is your prime concern, then there are many other options within the range which will facilitate with this. Both curves and right angles are covered, along with some of the more complex forms such as concave (pictured below) and bail making. Each will provide uniformity and consistency to jewellery pieces, which is vital for any sort of repeat work or small scale batch production. The parallel action mechanism itself is tried and tested and has stood the test of time, which is why we now offer so many different variations on a classic and reliable design. Many jewellers have had their original flat nose pair of parallel pliers for years and they are still going strong, so it is safe to say that these particular classic parallel action pliers are fantastic value for money whether you are just starting out or looking for new jewellery tools to add to your existing collection. Don’t forget, a variety of other jewellery making pliers are also stocked in our range – so make sure you have the right jewellery tools for the job and browse the extensive selection today.